Catalog Page 9. Custom frogs, dogs, rabbits, owls, alligators, horses and dalmations. Catalog Page 9. Custom frogs, dogs, rabbits, owls, alligators, horses and Dalmatians. Order 5" stuffed animals from the Q-Tee Collection. The pricing above includes a one-color printed t-shirt or accessory. Order custom stuffed animals that include Dalmatians, bunny rabbits, frogs, dogs, bulldogs, raccoons, moose, kangaroos, pigs, cows, horses and owls. 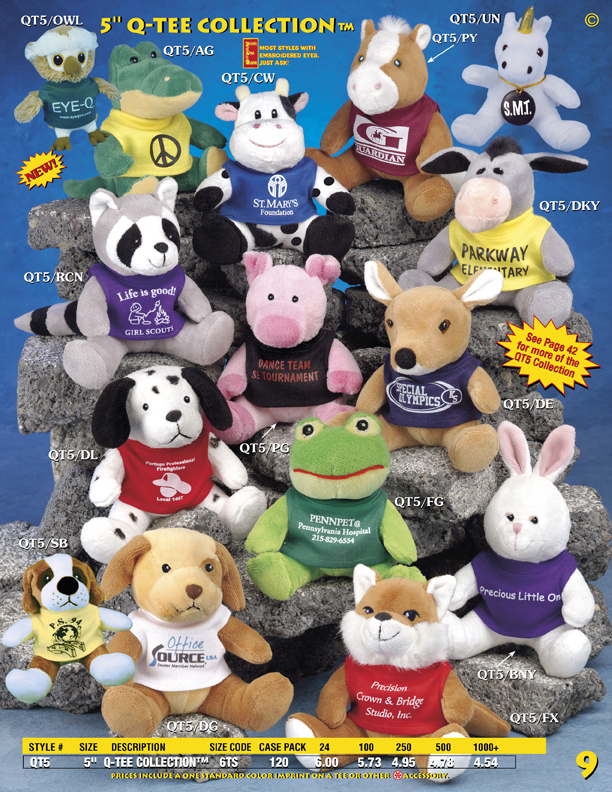 We have hundreds of styles of custom stuffed animals.